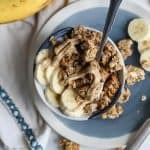 This simple Cashew Butter Banana Granola recipe is perfect for snack time or breakfast. My favorite is enjoying it yogurt topped with bananas and cashew butter! Gluten-free, vegan-friendly. Preheat oven to 300ºF and line large baking sheet with parchment paper or silicone mat; set aside. In a small bowl, combine chia seeds with water and let sit for about 3-5 minutes. In large bowl combine oats, cashew pieces and cinnamon; set aside. In a medium microwave safe bowl combine cashew butter, maple syrup, oil and mashed banana. You can also microwave cashew butter and maple syrup together before adding mashed banana if tough to stir. Add chia seed mixture and stir until combined. Transfer cashew butter banana mixture to bowl of oats, using large rubber spatula to combine at first before using hands to make sure oats are fully coated. Remove granola from oven and allow to cool completely, do NOT stir again. While the granola cools, the air will help set the crunchy texture. If you want less clusters, you can stir the granola here. Once the granola has cooled completely, store in airtight container. Granola should stay fresh up to 3 weeks – if it lasts that long. See notes about the process in the post. The granola is slightly softer in texture because of the banana mixed in. You can try stirring the granola more instead of flipping, which will reduce clusters and make crunchier texture. *This recipe is also not super sweet as written. Should you want a sweeter granola, I’d recommend adding in up to 1/4 cup brown or coconut sugar, stirring in with the wet ingredients. Recipe can be easily doubled for a larger batch. Nutrition approximate, based on about 1/3 cup servings.